“…James McGill Buchanan is a name you will rarely hear unless you’ve taken several classes in economics. And if the Tennessee-born Nobel laureate were alive today, it would suit him just fine that most well-informed journalists, liberal politicians, and even many economics students have little understanding of his work. “The reason? Duke historian Nancy MacLean contends that his philosophy is so stark that even young libertarian acolytes are only introduced to it after they have accepted the relatively sunny perspective of Ayn Rand. (Yes, you read that correctly). If Americans really knew what Buchanan thought and promoted, and how destructively his vision is manifesting under their noses, it would dawn on them how close the country is to a transformation most would not even want to imagine, much less accept. 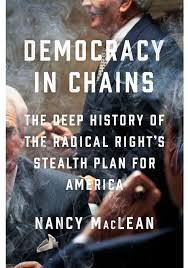 “That is a dangerous blind spot, MacLean argues in a meticulously researched book, Democracy in Chains, a finalist for the National Book Award in Nonfiction. While Americans grapple with Donald Trump’s chaotic presidency, we may be missing the key to changes that are taking place far beyond the level of mere politics. Once these changes are locked into place, there may be no going back. “…MacLean was stunned. The archive of the man who had sought to stay under the radar had been left totally unsorted and unguarded. The historian plunged in, and she read through boxes and drawers full of papers that included personal correspondence between Buchanan and billionaire industrialist Charles Koch. That’s when she had an amazing realization: here was the intellectual linchpin of a stealth revolution currently in progress. “…Buchanan, MacLean notes, was incensed at what he saw as a move toward socialism and deeply suspicious of any form of state action that channels resources to the public. Why should the increasingly powerful federal government be able to force the wealthy to pay for goods and programs that served ordinary citizens and the poor? “…The people who needed protection were property owners, and their rights could only be secured though constitutional limits to prevent the majority of voters from encroaching on them, an idea Buchanan lays out in works like Property as a Guarantor of Liberty (1993). MacLean observes that Buchanan saw society as a cutthroat realm of makers (entrepreneurs) constantly under siege by takers (everybody else) His own language was often more stark, warning the alleged ‘prey’ of ‘parasites’ and ‘predators’ out to fleece them. “In 1965 the economist launched a center dedicated to his theories at the University of Virginia, which later relocated to George Mason University. MacLean describes how he trained thinkers to push back against the Brown v. Board of Education decision to desegregate America’s public schools and to challenge the constitutional perspectives and federal policy that enabled it. She notes that he took care to use economic and political precepts, rather than overtly racial arguments, to make his case, which nonetheless gave cover to racists who knew that spelling out their prejudices would alienate the country. “…MacLean observes that both focused on how democracy constrains property owners and aimed for ways to restrict the latitude of voters. She argues that unlike even the most property-friendly founders Alexander Hamilton and James Madison, Buchanan wanted a private governing elite of corporate power that was wholly released from public accountability. “Suppressing voting, changing legislative processes so that a normal majority could no longer prevail, sowing public distrust of government institutions— all these were tactics toward the goal. But the Holy Grail was the Constitution: alter it and you could increase and secure the power of the wealthy in a way that no politician could ever challenge. “MacLean explains that Virginia’s white elite and the pro-corporate president of the University of Virginia, Colgate Darden, who had married into the DuPont family, found Buchanan’s ideas to be spot on. In nurturing a new intelligentsia to commit to his values, Buchanan stated that he needed a ‘gravy train,’ and with backers like Charles Koch and conservative foundations like the Scaife Family Charitable Trusts, others hopped aboard. Money, Buchanan knew, can be a persuasive tool in academia. His circle of influence began to widen. “…With Koch’s money and enthusiasm, Buchanan’s academic school evolved into something much bigger. By the 1990s, Koch realized that Buchanan’s ideas — transmitted through stealth and deliberate deception, as MacLean amply documents — could help take government down through incremental assaults that the media would hardly notice. The tycoon knew that the project was extremely radical, even a ‘revolution’ in governance, but he talked like a conservative to make his plans sound more palatable. “MacLean details how partnered with Koch, Buchanan’s outpost at George Mason University was able to connect libertarian economists with right-wing political actors and supporters of corporations like Shell Oil, Exxon, Ford, IBM, Chase Manhattan Bank, and General Motors. Together they could push economic ideas to public through media, promote new curricula for economics education, and court politicians in nearby Washington, D.C.
“At the 1997 fiftieth anniversary of the Mont Pelerin Society, MacLean recounts that Buchanan and his associate Henry Manne, a founding theorist of libertarian economic approaches to law, focused on such affronts to capitalists as environmentalism and public health and welfare, expressing eagerness to dismantle Social Security, Medicaid, and Medicare as well as kill public education because it tended to foster community values. Feminism had to go, too: the scholars considered it a socialist project. “Buchanan’s ideas began to have huge impact, especially in America and in Britain. In his home country, the economist was deeply involved in efforts to cut taxes on the wealthy in 1970s and 1980s and he advised proponents of Reagan Revolution in their quest to unleash markets and posit government as the ‘problem’ rather than the ‘solution.’ The Koch-funded Virginia school coached scholars, lawyers, politicians, and business people to apply stark right-wing perspectives on everything from deficits to taxes to school privatization. In Britain, Buchanan’s work helped to inspire the public sector reforms of Margaret Thatcher and her political progeny. “MacLean illustrates that in South America, Buchanan was able to first truly set his ideas in motion by helping a bare-knuckles dictatorship ensure the permanence of much of the radical transformation it inflicted on a country that had been a beacon of social progress. The historian emphasizes that Buchanan’s role in the disastrous Pinochet government of Chile has been underestimated partly because unlike Milton Friedman, who advertised his activities, Buchanan had the shrewdness to keep his involvement quiet. With his guidance, the military junta deployed public choice economics in the creation of a new constitution, which required balanced budgets and thereby prevented the government from spending to meet public needs. Supermajorities would be required for any changes of substance, leaving the public little recourse to challenge programs like the privatization of social security. “The dictator’s human rights abuses and pillage of the country’s resources did not seem to bother Buchanan, MacLean argues, so long as the wealthy got their way. ‘Despotism may be the only organizational alternative to the political structure that we observe,’ the economist had written in The Limits of Liberty. If you have been wondering about the end result of the Virginia school philosophy, well, the economist helpfully spelled it out. “Most Americans haven’t seen what’s coming. MacLean notes that when the Kochs’ control of the GOP kicked into high gear after the financial crisis of 2007-08, many were so stunned by the ‘shock-and-awe’ tactics of shutting down government, destroying labor unions, and rolling back services that meet citizens’ basic necessities that few realized that many leading the charge had been trained in economics at Virginia institutions, especially George Mason University. Wasn’t it just a new, particularly vicious wave of partisan politics? It wasn’t. MacLean convincingly illustrates that it was something far more disturbing. “MacLean is not the only scholar to sound the alarm that the country is experiencing a hostile takeover that is well on its way to radically, and perhaps permanently, altering the society. Peter Temin, former head of the MIT economics department, INET grantee, and author of The Vanishing Middle Class, as well as economist Gordon Lafer of the University of Oregon and author of The One Percent Solution, have provided eye-opening analyses of where America is headed and why. MacLean adds another dimension to this dystopian big picture, acquainting us with what has been overlooked in the capitalist right wing’s playbook. “She observes, for example, that many liberals have missed the point of strategies like privatization. Efforts to ‘reform’ public education and Social Security are not just about a preference for the private sector over the public sector, she argues. You can wrap your head around those, even if you don’t agree. Instead, MacLean contends, the goal of these strategies is to radically alter power relations, weakening pro-public forces and enhancing the lobbying power and commitment of the corporations that take over public services and resources, thus advancing the plans to dismantle democracy and make way for a return to oligarchy. The majority will be held captive so that the wealthy can finally be free to do as they please, no matter how destructive. 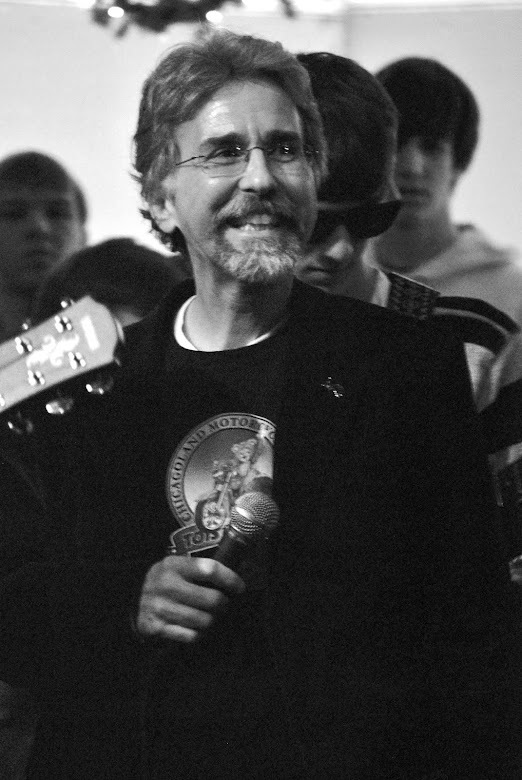 “MacLean argues that despite the rhetoric of Virginia school acolytes, shrinking big government is not really the point. The oligarchs require a government with tremendous new powers so that they can bypass the will of the people. This, as MacLean points out, requires greatly expanding police powers ‘to control the resultant popular anger.’ The spreading use of pre-emption by GOP-controlled state legislatures to suppress local progressive victories such as living wage ordinances is another example of the right’s aggressive use of state power. “Could these right-wing capitalists allow private companies to fill prisons with helpless citizens—or, more profitable still, right-less undocumented immigrants? They could, and have. Might they engineer a retirement crisis by moving Americans to inadequate 401(k)s? Done. Take away the rights of consumers and workers to bring grievances to court by making them sign forced arbitration agreements? Check. Gut public education to the point where ordinary people have such bleak prospects that they have no energy to fight back? Getting it done. “Would they even refuse children clean water? Actually, yes. MacLean notes that in Flint, Michigan, Americans got a taste of what the emerging oligarchy will look like — it tastes like poisoned water. There, the Koch-funded Mackinac Center pushed for legislation that would allow the governor to take control of communities facing emergency and put unelected managers in charge. In Flint, one such manager switched the city’s water supply to a polluted river, but the Mackinac Center’s lobbyists ensured that the law was fortified by protections against lawsuits that poisoned inhabitants might bring. Tens of thousands of children were exposed to lead, a substance known to cause serious health problems including brain damage. “Tyler Cowen has provided an economic justification for this kind of brutality, stating that where it is difficult to get clean water, private companies should take over and make people pay for it. ‘This includes giving them the right to cut off people who don’t—or can’t—pay their bills,’ the economist explains. “To many this sounds grotesquely inhumane, but it is a way of thinking that has deep roots in America. In Why I, Too, Am Not a Conservative (2005), Buchanan considers the charge of heartlessness made against the kind of classic liberal that he took himself to be. MacLean interprets his discussion to mean that people who ‘failed to foresee and save money for their future needs’ are to be treated, as Buchanan put it, ‘as subordinate members of the species, akin to…animals who are dependent.’ Do you have your education, health care, and retirement personally funded against all possible exigencies? Then that means you. “Buchanan was not a dystopian novelist. He was a Nobel Laureate whose sinister logic exerts vast influence over America’s trajectory. It is no wonder that Cowen, on his popular blog Marginal Revolution, does not mention Buchanan on a list of underrated influential libertarian thinkers, though elsewhere on the blog, he expresses admiration for several of Buchanan’s contributions and acknowledges that the southern economist ‘thought more consistently in terms of ‘rules of the games’ than perhaps any other economist.’ The rules of the game are now clear. “Research like MacLean’s provides hope that toxic ideas like Buchanan’s may finally begin to face public scrutiny. Yet at this very moment, the Kochs’ State Policy Network and the American Legislative Exchange Council (ALEC), a group that connects corporate agents to conservative lawmakers to produce legislation, are involved in projects that the Trump-obsessed media hardly notices, like pumping money into state judicial races. Their aim is to stack the legal deck against Americans in ways that MacLean argues may have even bigger effects than Citizens United, the 2010 Supreme Court ruling which unleashed unlimited corporate spending on American politics. The goal is to create a judiciary that will interpret the Constitution in favor of corporations and the wealthy in ways that Buchanan would have heartily approved. Meet the Economist Behind the One Percent’s Stealth Takeover of America by Lynn Parramore. Lynn Parramore is a senior research analyst at Institute for New Economic Thinking.